This year’s summer concerts celebrated popular music from each decade of the 90 years of the life of HM Queen Elizabeth II. The Queen was born in 1926 so the concert began in the 1920s with a medley by the choir from Showboat by Jerome Kerne and Oscar Hammerstein II, in its day a new genre of musical play. Next a trio of Helen Pearce (soprano), Abby Evans (alto) and Frances Brightman (alto) sang an Someone To Watch Over Me by George and Ira Gershwin. Moving onto the 1930s, the trio sang with Dream A Little Dream Of Me by Gus Kahn, Fabian Andre and Wilbur Schwandt. continuing in the 1930s, the choir then returned to sing A Nightingale Sang In Berkeley Square by Manning Sherwin and Eric Maschwitz. The 1940s saw various popular shows by Richard Rodgers and Oscar Hammerstein II. This section of the concert featured the choir singing the title song from Oklahoma and You’ll Never Walk Alone from Carousel, and there Is Nothin’ Like a Dame from South Pacific by the male chorus (solo: Hugh Hercus). Other songs from the 1940s were We’ll Gather Lilacs In The Spring from Perchance to Dream by Ivor Novello sung by the choir and three solos – True Love by Cole Porter sung by Elizabeth Dobson (alto), Vera Lynn’s famous wartime song, The White Cliffs of Dover by Walter Kent and Nat Burton, sung by Helen Pearce (soprano) and When I Fall In Love by Edward Heyman and Victor Young sung by Terry Pearce (bass). Four songs showcased the 1950s. 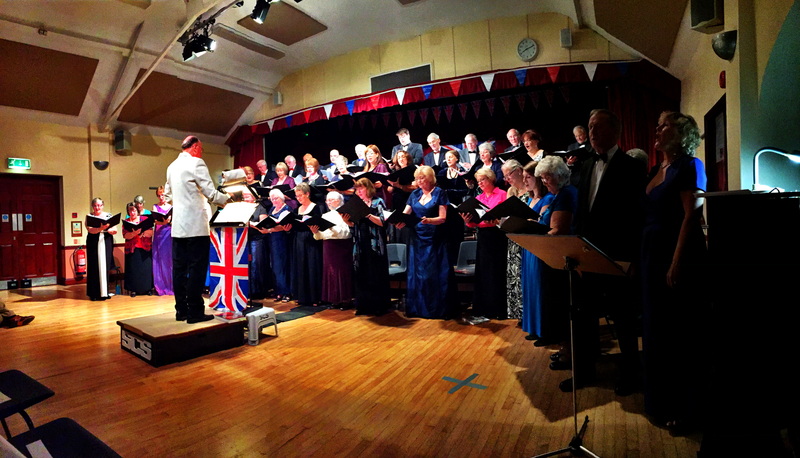 First the ladies chorus sang I Leave My Heart In An English Garden by Davies and Hassall. The choir then sang Unchained Melody by Alex North and Hy Zaret, Climb Every Mountain from The Sound of Music by Richard Rodgers and Oscar Hammerstein II, and the Black Hills of Dakota from Calamity Jane by Sammy Fain and Paul Webster. The first half of the concert ended with the 1960s and that meant The Beatles. 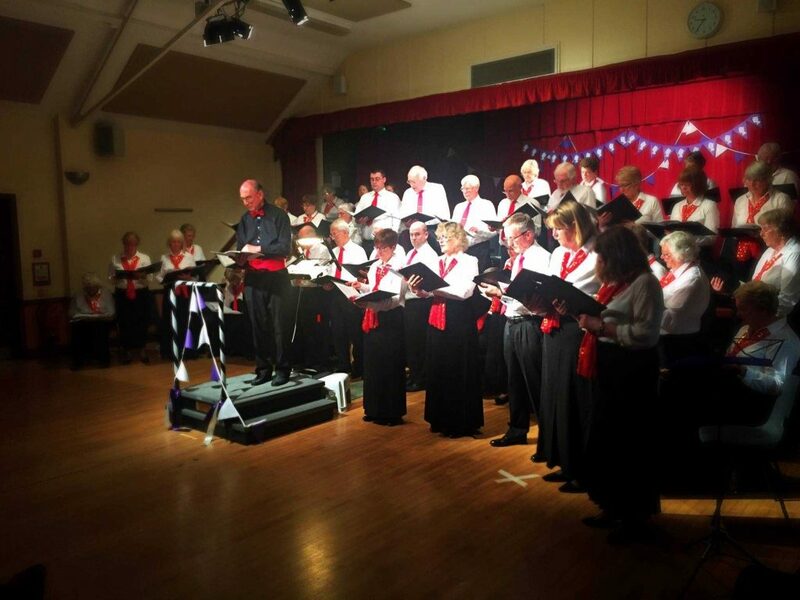 The audience was encouraged to join in Yellow Submarine and When I’m 64 by John Lennon and Paul McCartney, before the choir sang Consider Yourself from Oliver by Lionel Bart. 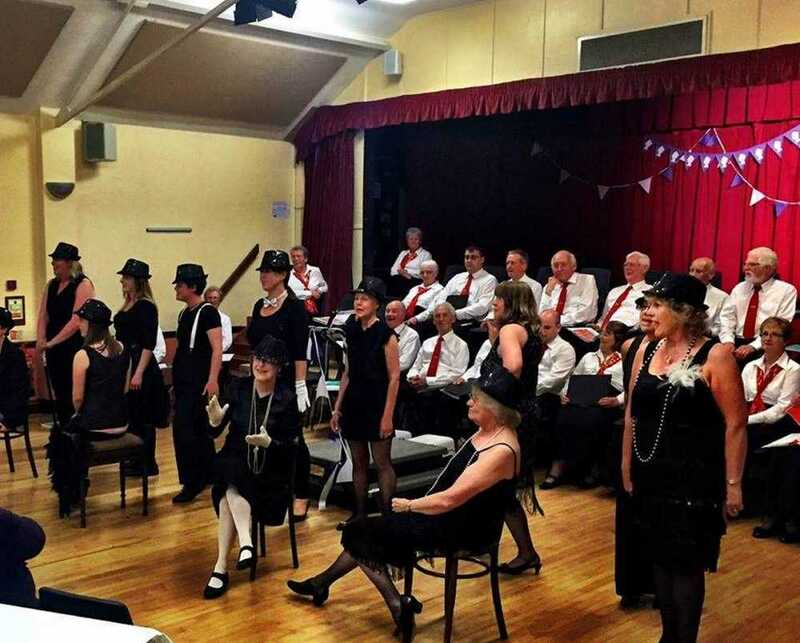 The second half began in the 1970s with All That Jazz from the musical Chicago by john Kander and Fred Ebb with the Steventon Choral Society Dancing Girls. The the choir sang an arrangement of Annie’s Song by John Denver and a selection of songs by Abba written by Benny Andersson, Bjorn Ulvaeus and Stig Anderson. The 1980s was celebrated by the choir singing Love Changes Everything from Aspects of Love by Andrew Lloyd-Webber, Charles Hart and Don Black, and a medley from Les Miserables by Claude-Michel Schönberg and Herbert Kretzmer (soloists: Helen Pearce, Rebecca Joisce, Abby Evans, Frances Brightman and Hugh Hercus). For the 1990s, the choir sang The Lion Sleeps Tonight (‘Wimoweh’) by Solomon Linda, George Weiss, Hugo Peretti and Luigi Creatore, and Can You Feel The Love Tonight by Elton John and Tim Rice from The Lion King from the 1990s. For the 2000s, Howard Feather (tenor) sang Elbow’s ever popular One Day LIke This. 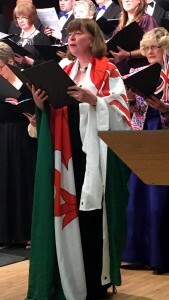 For the 2010s, a quartet of Helen Bell (soprano), Elizabeth Dobson (alto), Howard Feather (tenor) and Phil Brazier (bass) sang Call Me Maybe by Carly Rae Jepsen, Josh Ramsay and Tavish Crowe, and the ladies chorus sang Wherever You Are by Paul Mealor (soloist: Helen Pearce) made famous by the Miliary Wives’ Choir under the direction of Gareth Malone. 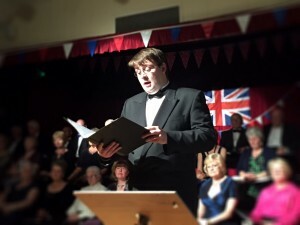 The concert ended with the audience joining in with three patriotic songs – Holst’s I Vow to Thee My Country, Parry’s Jerusalem and Elgar’s Land of Hope and Glory. This concert on Palm Sunday opened with the famous Easter hymn by Isacc Watts, When I Survey the Wondrous Cross. This was followed by three pieces from The Peacemakers by Karl Jenkins, which features texts on the theme of peace: Peace, Peace (Percy Bysshe Shelley), Healing Light – A Celtic Prayer (Anon) and Dove of Peace (Carol Barratt). 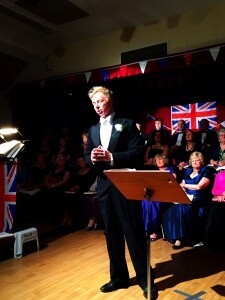 The main piece of the concert was Mozart’s Coronation Mass in C (K. 317) with soloists Helen Pearce (soprano), Abby Evans (contralto), Howard Feather (tenor) and Leslie Macleod-Miller (bass baritone). Guest soloist, Leslie Macleod-Miller, then sang It Is Enough from Mendelssohn’s Elijah and Sancta Maria from Mascagni’s Cavalleria Rusticana. The concert ended with the choir singing Requiem Aeternam, a choral setting of Nimrod from Edward Elgar’s Enigma Variations. Three groups of ‘carol singers’ came into the hall and were urged by the audience to join the musical director and his very small choir. 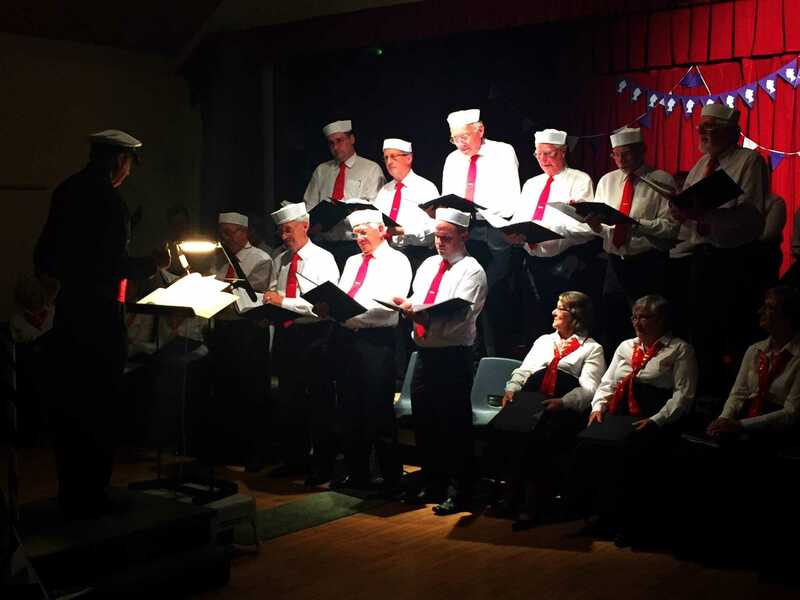 Shedding their coats and scarves to reveal themselves as fellow members of Steventon Choral Society, they took their places on the stage and the concert began with Christmas Is Coming and On This Day Earth Shall Ring. Next came two carols by John Rutter – Love Came Down at Christmas and the Angels Carol. Rebecca Joisce (soprano), accompanying herself on her auto-harp, then sang the 14th century lullaby, Sweet Was The Song the Angel Sang. 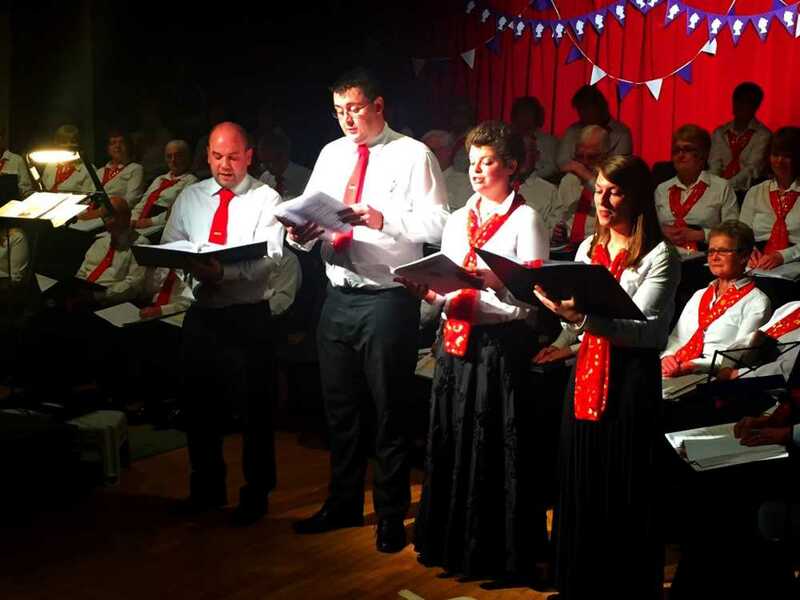 This was followed by the choir Ding Dong Merrily On High before the audience was invited to join in with Good King Wenceslas (King: Howard Feather, Page: Helen Bell – Thursday, Danielle Beeken – Saturday) and O Little Town of Bethlehem. The story of the Christmas Pudding and friends – the turkey, the Christmas tree, the wrapping paper and the cracker – was then told by Mo Hunt, Caroline Miller, Vivienne Dann, Trish Napper and Edward Dann. The choir returned to sing an arrangement of Away In A Manager by Gjeilo (soloist: Helen Bell, soprano) and Harold Darke’s popular arrangement of In The Bleak Mid-Winter. The ladies then sang The Russian Carol before the first half ended with the full choir singing the first chorus from Handel’s Messiah – And the Glory of the Lord. The second half began with a rendition by John Hunt of The ‘Ole in the Ark, a monologue by Marriott Edgar. The choir then sang God Bless Us Everyone from Disney’s A Christmas Carol and one of the nation’s favourite carols, O Holy Night with soloists Helen Pearce (soprano) and Howard Feather (tenor). A small group (Helen Pearce, Helen Bell, Danielle, Beeken, Abby Evans and Frances Brightman) then performed a shortened but melodic version of the Twelve Days of Christmas before the choir sang Deck the Hall and First Christmas, the first performance of a carol specially composed for Steventon Choral Society by former regular pianist Michael Evans with words by choir member Trish Napper. Then it was the audience’s turn to join in with We Three Kings Kings (Hugh Hercus, Jack Jarvis, Martin Blogg/John Hunt) and Hark the Herald Angels Sing. This was followed by Elizabeth Dobson (contralto) singing The Sans Day Carol (a Cornish Christmas carol written in the 19th century) and The Snowman sung by Abby Evans and Frances Brightman. The choir then sang Lullaby by Karl Jenkins and Christmas Day by Holst before everyone joined in with O Come All Ye Faithful. The concert ended with the choir singing the Hallelujah chorus from Handel’s Messiah. The church at Letcombe Bassett is only small so about 20 choir members were there to sing a selection of Christmas carols and songs. These included well-known carols for the audience to join in. The concert also featured Abby Evans and Frances Brightman singing an arrangement of Walking In the Air, and Terry Pearce singing Mary’s Boy Child (accompanying himself on the guitar). The Twelve Days of Christmas and Silent Night were sung by small groups from the choir, and a further group told us the story of the Christmas pudding and friends – the turkey, the Christmas tree, the wrapping paper and the cracker. 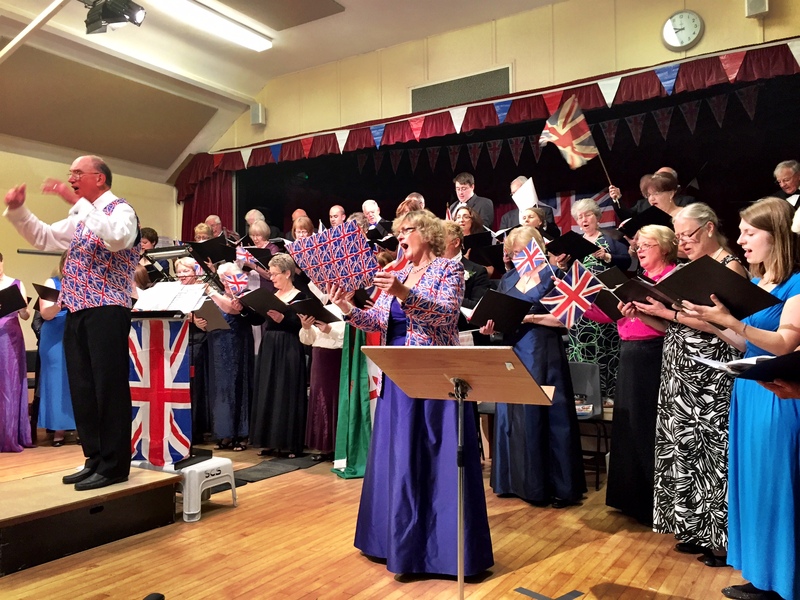 This special concert, the 7th given by Steventon Choral Society for the biannual Voices for Hospices event, began with the arrangement by Sir David Willcocks of The National Anthem for the marriage of the Prince of Wales and Lady Diana Spencer in 1984. Sir David, who died in September this year, was a particular favourite and hero of our musical director Terry Pearce. The theme for the first half of the concert was opera. The choir sang first The Bridal Chorus from Wagner’s Lohengrin and then the Chorus of the Hebrew Slaves from Verdi’s Nabucco. In the first of the concert’s solos, Abby Evans (contralto) sang the aria Caro Mio Ben (O gentle maid, hear now my sighs) by Giordani and made famous by Luciano Pavarotti. Abby was followed by guest soloist Leslie MacLeod-Miller with Oh, Could I In Song Tell My Sorrow by the Russian composer and conductor, Leonid Dimitrievitch Malashkin and O Star Of Eve from Wagner’s Tannhäuser. The full choir then sang The Pilgrim’s Chorus from Tannhäuser followed by the ladies singing The Polovtsian Dances from Borodin’s Prince Igor. 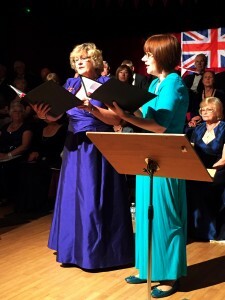 Helen Pearce (soprano) and Frances Brightman (contralto) followed with the Flower Duet from Lakme by Delibes and Elizabeth Dobson (contralto) sang Habanera from Bizet’s Carmen. The first half closed with two pieces from The Merry Widow by Lehar – Vilia sung by Helen Pearce and the Merry Widow Waltz performed by Helen Pearce and Hugh Hercus (tenor). 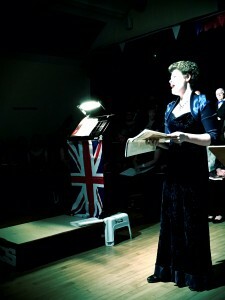 The second half of the concert began with a selection of pieces by Gilbert and Sullivan – Brightly Dawns Our Wedding Day from The Mikado, Hail Poetry from the Pirates of Penzance, I Hear The Soft Note (solo: Trish Napper) from Patience, Strange Adventure from Yeoman of the Gard and When Britain Really Ruled the Waves (solo: Terry Pearce) from Iolanthe. Then it was back to opera with Nessun Dorma from Turendot by Puccini, sung by Howard Feather (tenor) and a return from guest soloist Leslie MacLeod-Miller who sang Because You’re Mine (a song made famous by Mario Lanza) and When The Sergeant Major’s On Parade, a rousing song by Ernest Longstaffe from 1925. 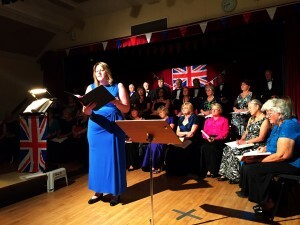 The choir then returned to sing Parry’s rousing anthem, I Was Glad (quartet: Helen Pearce, Abby Evans, Jack Jarvis and Phil Brazier), to set the patriotic mood ahead of the last part of the concert – selection of songs from the Last Night of the Proms for the audience to join in with.